Attendees at the Clean Energy Materials Innovation Challenge workshop on 11 Sept 2017 in Mexico City. In MI’s first deep-dive workshop among the seven MI Innovation Challenge topics, participants engaged in technical discussions on combining advanced theoretical and applied physical chemistry with next-generation computing, machine learning, and robotics, with the aim of developing an integrated materials innovation approach. The workshop focused on organic and inorganic functional materials, nanomaterials, and composites. 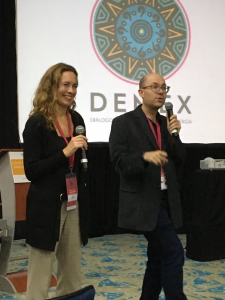 Workshop Co-Chairs Professor Kristin Persson of University of California-Berkeley and Professor Alán Aspuru-Guzik of Harvard University. For more information, contact Clean Energy Materials Challenge Executive Chair and Mexico lead Dr. Hermann Tribukait (htribukait.fse AT energia.gob.mx), U.S. co-lead Maureen Clapper (maureen.clapper AT hq.doe.gov), or workshop local chair Professor Carlos Amador Bedolla (carlos.amador AT unam.mx), or see the workshop website.